Quang Binh (Vietnam) – May 31, 2018 (travelindex) – Best Western Hotels & Resorts has entered yet another exciting destination in Vietnam with the signing of a Memorandum of Understanding (MoU) for a new upscale beach resort in Dong Hoi, on the country’s stunning north-central coast. 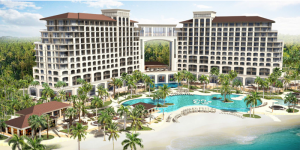 Scheduled to open in 2020, Best Western Premier Quang Binh will be an impressive international resort overlooking the East Sea. Dong Hoi, which is set on a 12km-long coastline with white sandy beaches, is the capital of Vietnam’s Quang Binh province. It is also the gateway to Phong Nha-Ke Bang National Park, a UNESCO World Heritage-listed landscape that houses Son Doong, the world’s largest cave. “Vietnam has over 3,400 km of coastline, much of which is only just opening up to tourism. With its dramatic landscapes and pristine seafront, Quang Binh is one of the country’s most spectacular provinces and looks set to become a highly desirable destination,” said Olivier Berrivin, Best Western’s Managing Director of International Operations – Asia.